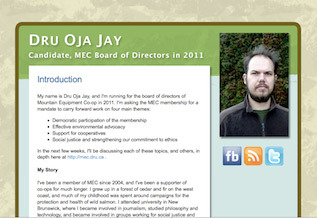 To win a seat on the MEC board, one needs a little over 10,000 votes. To make that possible, we need 100 people to do some of the things listed below. According to our calculations, you can do these things in about 12.5 minutes. Are you willing to be one of those 100 people? If you do three of the following, email candidate_jay@mec.ca and I'll thank you personally and add your name to the list at the bottom of the page. Go to your profile, and paste it into the status update box. Write one sentence about why you support the campaign, and post. Log in to your twitter account. Go to this page. Click on "retweet". Write a line or two about why you support this campaign, and send it to candidate_jay@mec.ca . I'll add it to a page on this site, and send updates to others. Just copy one of the campaign statements (see the links in the sidebar). More will be added weekly in the leadup to the election. MEC's membership represents 1 in 10 Canadians. Shouldn't their board election get some coverage? Send a quick note to a local journalist or your favourite independent publication, suggesting they do an interview or write an article.